NEW YORK, Jan. 22, 2019 (GLOBE NEWSWIRE) -- Piedmont Lithium Limited (“Piedmont” or “Company”) is pleased to advise that following completion of its recent capital raising the Company has initiated a 25,000-meter Phase 4 drill program at the Piedmont Lithium Project (“Project”) located within the world-class Carolina Tin-Spodumene Belt (“TSB”) which will aim to significantly expand on the 13-year project life reported in the Scoping Study released on September 13, 2018. 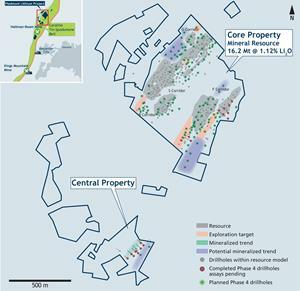 Core and Central Properties with Resource, Exploration Targets, and mineralized trends. Three drill rigs have been mobilized with two currently committed to the Core property and one to the Central property. The Core program will consist of approximately 110 holes totaling 19,000 meters and is designed to drill the Exploration Target areas reported June 14, 2018, perform initial drilling on newly acquired properties contiguous to the Core property, and upgrade portions of the current Mineral Resource Estimate from Inferred to Indicated classification (see Figure 1). The remaining 6,000 meters is allocated to follow-up drilling on the Central and Sunnyside properties, and initial drill testing of new or other properties not yet drilled with the potential to define a Mineral Resource Estimate on one or more of these additional properties. The 110 hole, 19,000-meter Core property drill campaign is designed to increase the overall Mineral Resource Estimate and to upgrade a portion of the current Mineral Resource from the Inferred to the Indicated Category. Significant portions of the drill program will focus on a previously reported Exploration Target of between 4.5 to 5.5 million tonnes grading between 1.10% and 1.20% Li2O (Figure 1) on the Core property with the objective of converting some or all of this to a Mineral Resource. The potential quantity and grade of this Exploration Target is conceptual in nature. There has been insufficient exploration to estimate a Mineral Resource and it is uncertain if further exploration will result in the estimation of a Mineral Resource. Recently-announced land acquisitions contiguous to the Core Property provide significant additional exploration potential. These tracts are located in the southeast and western portions of the Core Property. These properties have added 600 meters of highly prospective strike length along the F corridor and 400 meters of highly prospective strike length along the G Corridor. In combination with the current Exploration Target these new properties have potential to add to the Core Property’s current Mineral Resource Estimate of 16.2 Mt @ 1.12% Li2O reported June 14, 2018. One rig was mobilized to the Central Property in December and has to-date completed 8 holes totaling 1,204.8 meters (Figure 1). These holes were designed to follow-up the intercepts from holes 18-CT-001 (7.0m @ 1.53% Li2O) and 18-CT-002 (34.0m @ 1.04% Li2O), reported October 17, 2018. Holes 18-CT-004 through 18-CT-011 all intercepted spodumene-bearing pegmatite with intercepts ranging from 5 to 19 meters. This extends the strike length of the mineralized dike encountered at Central for over 320 meters and it remains open in all directions. Assays are pending for these holes. X-Ray Diffraction analysis of two samples from hole 18-CT-002 confirm spodumene is the only primary lithium bearing mineral in the mineralized pegmatites. The primary mineralogy is consistent with Piedmont’s Core property consisting principally of quartz, albite, spodumene, muscovite and microcline. In 2018 the Company completed 33-line kilometers of magnetometer surveys and collected 1,216 soil samples on Sunnyside, Central and other regional properties. Drill targets have been identified based on the results of soil sampling and selective drilling of these targets will take place during Phase 4.